On Remembrance Day 2013 Platform-7 simultaneously staged 38 live interventions across 30 London streets, 4 English towns and 4 international locations. Each individual performance acted as a casualty of a sudden explosion, collectively they sought to highlight the sudden calmness and silence that exists moments prior to an attack. Performances told the story of their location, conveyed by the place rather than by a person. Together they formed Silent Cacophony, individually they acted as standalone pieces. 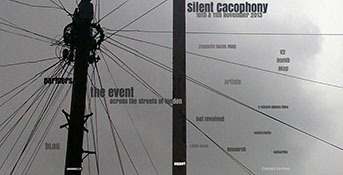 The collaboration between Platform-7 and King’s College London employed a participatory action research methodology in order to report upon Silent Cacophony, uncovering ways of working and future directions that Platform-7 might take. Professor Andy Pratt’s report assessed: audience and participants, artistic practices, place and time based activities, curatorial approaches to deduce the final block required to create a new chapter in the company. The report was innovative in its unorthodox anthropological perspective, suspended normative assumptions and focusing on accounts from practitioners. Unfortunately, since the competition of the collaboration Platform-7 has decided to wind down operation except for the organisation of occasional events. A new company, Creative Publics has been created which can hopefully profit from the conclusions and analysis uncovered during the partnership.